For ages I have wanted to create a permanent altar area where I can honour mine and my husbands ancestors. I had seen this post on the lovely Witchy Words blog and was totally inspired to create my own altar that would stay in place year round. I didn’t seem to be able to find the right space in my old altar room that would allow me to do this in the style I wanted to. Even though the old room was much larger than my current room I just didn’t have the space I needed. When I was making a plan of all the things I wanted to include in the design layout for the new room, an ancestor altar was right up there near the top of the list. I bought a revamped set of pine shelves a few years back that had been painted cream and then aged. They have been moved from my kitchen to my altar room and they looked great in both spaces. I knew however cream wasn’t a colour I wanted in this new space so out came the paints and a total change was made. 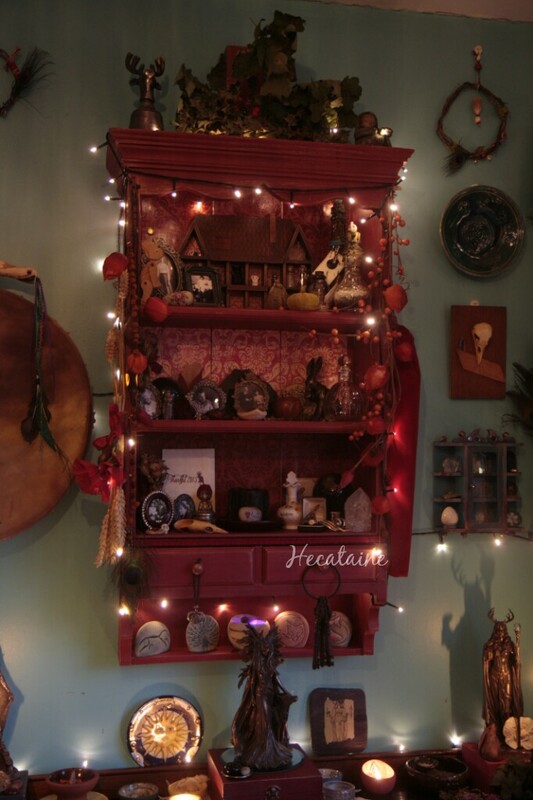 The shelf looked perfect above my main altar and thankfully everything I had collected up from memory boxes and around the house fitted perfectly on the three shelves. There’s even the little house display box on the top shelf that hold tiny items so that they don’t get lost amongst the pictures. Over the years I have collected tiny picture frames, I love them and have loads of them all over the house. All the ones I had with photos of our relatives who are no longer with us in this life, I collected up and took upstairs. I also moved both my ancestor spell bottles and some other items like a little wooden teddy bear I was given as a child by my great aunt. The crow skull my dad found the year after I was born, hangs on it’s mount next to the altar along with the two Samhain wreaths I made last year. Kept safe within the two little draws at the bottom of the shelf unit are the prayer books my nan and granddad were given when they were children, some letters and old birthday cards and copies of my dad’s school reports that I found one day while looking through a box of paper work with my parents. The narrow shelf at the bottom of the unit was the perfect place to add five pieces of my Amber Vincent pottery collection. I actually have quite a lot of her work but these five are some of my favourite.